Power, speed, and wireless operation are all benefits of this AD360II-N WITSTRO TTL Portable Flash Kit from Godox, which here includes a Power Pack so that you have all the essential equipment needed to go out and start shooting. This setup provides you with a powerful bare-bulb lighting system that can output approximately 450 full-power flashes before needing to be recharged. Power in a portable package is the key advantage provided by the AD360II-N WITSTRO TTL Flash from Godox. Combine this with a bare-bulb design that is capable of outputting 360Ws and you will be able to easily create a beautiful 360° light source that takes very well to modifiers. Another benefit of this unit is the built-in 2.4GHz X radio system that enables reliable wireless operation and control in addition to optical master/slave functionality with complete compatibility with Nikon i-TTL. The AD360II-N is able to function much like a standard shoe-mounted flash, including the ability to tilt from -15 to 90° and rotate a total of 270° for bounce flash techniques. It also has a rated guide number of 262' at ISO 100 when using the included reflector. In order to provide this power with a recycle time of 0.05-4.5 seconds, the flash requires the use of the separately available PROPAC PB960 Lithium-Ion Flash Power Pack, which can provide enough energy for 450 full-power flashes. In addition to these capabilities, the i-TTL support enables high-speed, 1st and 2nd curtain sync modes. And, the flash has a Wireless Control Port along with PC and 3.5mm sync sockets. A bare-bulb design creates a 360° light source that is flattering and easy to use with many optional modifiers. The AD360II-N has an output of 360Ws, which equates to a rated guide number of 262' at ISO 100 when using the included reflector. Built-in 2.4GHz X radio system allows it to be set as a slave and triggered from up to 328' away by a supported X series transmitter as well as be used as a master where it can trigger other flashes from up to 230' away. This system supports both Canon and Nikon TTL systems, as an X series transmitter can trigger either a Canon-compatible or Nikon-compatible model with TTL communication, regardless of the model of transmitter used. Compatible with Nikon i-TTL, this flash is able to offer auto exposure and other advanced functions. This includes high-speed sync up to 1/8000 second and both 1st and 2nd curtain sync. The flash head can tilt from -15 to 90° and rotate 270°. Manual power control is available from 1/1 to 1/128. The AD360II-N is able to function as an optical master or slave with full TTL functionality. Powered by the separately available PROPAC PB960 power pack, this flash offers a recycle time of just 0.05-4.5 seconds. A Wireless Control Port supports to use of the FT-16 system for wireless manual power control via a compatible trigger. Wired sync options include 3.5mm and PC ports. A micro-USB port is available for future firmware updates. 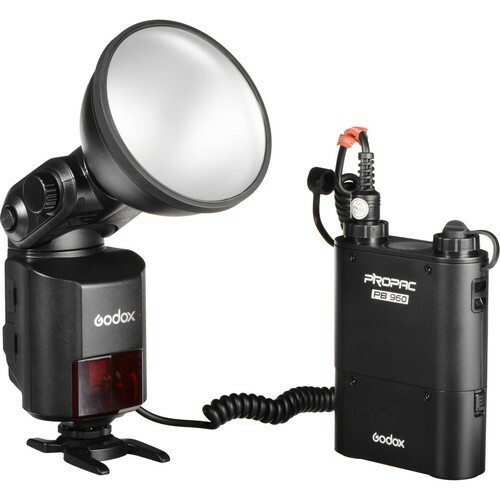 Shoot for longer while enjoying faster recycle times by picking up this PROPAC PB960 Lithium-Ion Flash Power Pack from Godox. Designed to work with most shoe-mounted flashes, this 4500mAh lithium-ion power pack will boost the performance of your speedlights and bare-bulb flashes and provide 900-1800 full-power flashes on a single charge. It also features dual power ports for powering two flashes simultaneously and will even recharge top-end units in just 1 second at full power. Additionally, it recharges in about three hours and features an LED display to alert users to current charge status and overheating warnings. And, it comes with both a belt clip and a shoulder strap for comfortable carrying. The high-capacity 4500mAh Li-ion battery provides up to 900 full-power flashes with the AD180 and 1800 full-power flashes with a speedlight. This unit features two output ports with anti-drop designs for connecting to multiple flashes simultaneously. Optional cables are available to ensure compatibility, and an optional Y adapter can be used to halve recycle times. A standard speedlight will recycle in 1 second or less at full power. LED display alerts user to current charge status and if there is a danger of overheating. Recharges in approximately 3 hours. Carrying options include a belt clip and a shoulder strap.